The Ultimate PLAY and STORE solution for your Nintendo Switch. This GOPLAY bundle protects your Nintendo Switch system in this 100% Nintendo licensed Switch case manufactured to Nintendo's stringent standards by RDS Industries. The GOPLAY Traveler case durable hard-shell exterior protects against accidental drops or knocks, and the vacuum foamed felt lined interior holds the system and games securely in place. Most importantly, a padded divider is in place designed specifically to protect Switch's sensitive analog sticks. The GOPLAY GRIP improves game play via the comfort ergonomic rubberized grips that lessen game fatigue. The GOPLAY Grip also serves as a stable and secure viewing stand. 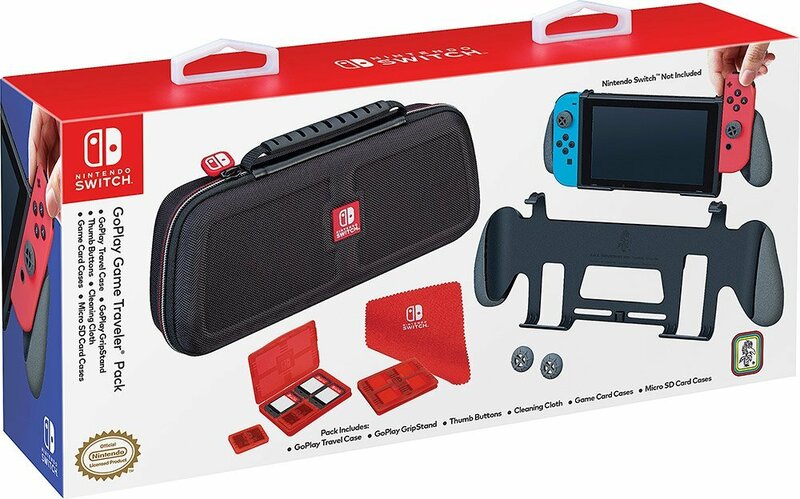 BONUS: two multi-case cases are included that hold up to 8 games, two rubberized analog stick thumb covers for added comfort, and a micro fiber screen cleaning cloth. BY FAR the BEST Nintendo Switch bundle on the market. #1 Nintendo Licensed Switch Case Manufacturer. Designed Specially To Protect Switch's Sensitive Joy-Con Analog Sticks, Padded Screen Protection Panel. Perfect Fit Vacuum Formed Interior-Felt Lined. Goplay Case: Tough Exterior Hard Case Covered In Ballistic Nylon, Rubberized Handle For Comfortable Carrying, Custom Easy-Glide Zipper And Zipper Pull With Accent Color. Goplay Grip Stand: Awesome Rubberized Grips That Allow You To Hold Your Switch More Comfortably And With Easy, Designed For Easy Joy-Con Attachment And Detachment. 2 BONUS multi-game cases - holds 8 Nintendo games in a safe environment, 2 Micro SD card cases - fits into any section of the game cases, HIGH GRADE screen micro fiber cleaning cloth.